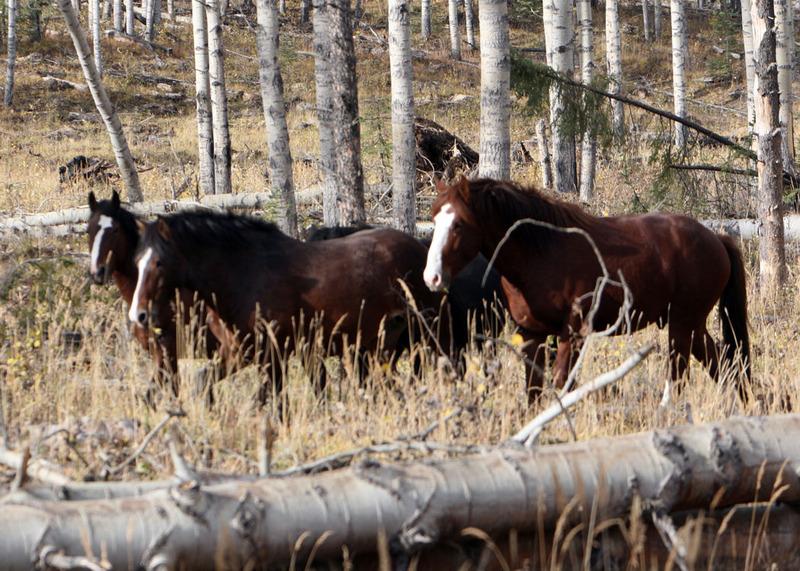 Fall is upon us and it has been a glorious one in the foothills of Alberta that the wild horses call home. The grass is golden and abundant, which adds to the scenic beauty of this range. It can make for some wonderful photographs for those of us that love this time of year. 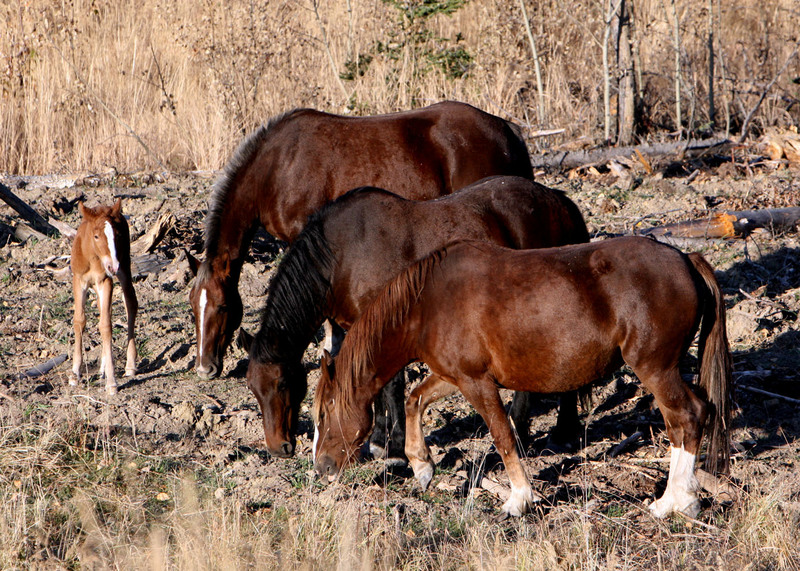 For the wild horses it is a blessing as they are able to build up their fat reserves for the winter yet to come. All the horses that I have come across and photographed are in excellent shape with their coats thickening up quickly. In some of the meadows I have ridden through the grass is still up to the bellies of my horses. This is excellent as it will able the wild horses and wildlife that rely on the meadows to find forage over the winter months. With forcaster’s calling for the coldest and worst winter in years to come, all of mother nature’s creatures will need a good food source. I know who the mom is! 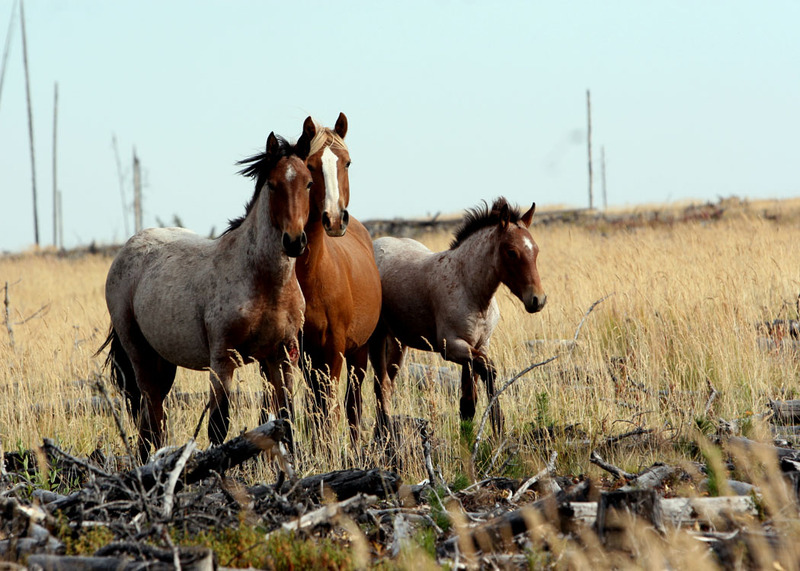 The wild horses are starting to come into their wintering areas and there you can find two or three herds living in close proximity to each other. The stallions of a herd will tolerate this closeness only as long as the undefined boundary is kept. 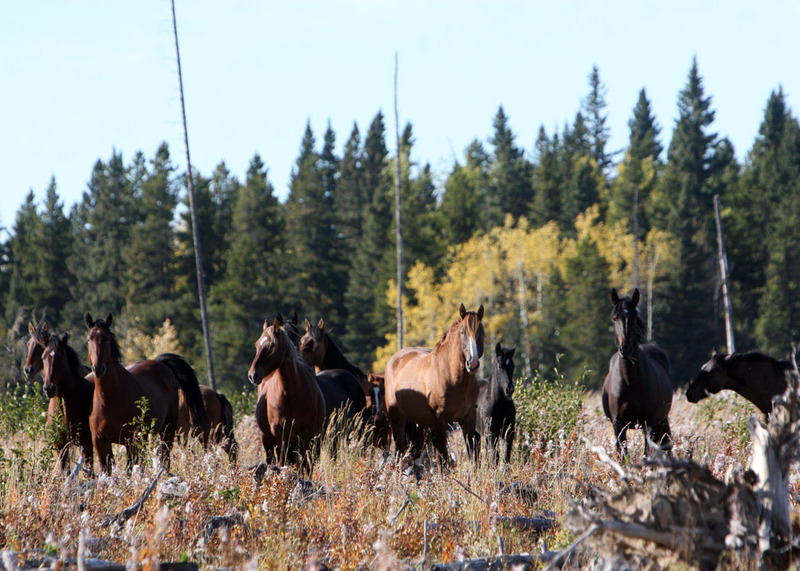 As I have travelled along on the horse trails this fall, I have started to come across some of the herds that had found refuge from the bugs, heat and extra traffic that occurs in the summer months. In these travels we have noted that this spring’s foals are doing extremely well and hopefully will be able to survive the hardships yet to come in their lives. Yet every once in a while we come across late born foals in a herd. This causes me to worry about their welfare and ability to survive from both the cold and also the predators that prey upon the horses. Such is the case this past weekend when we went out for another ride on our horses. Here I met up with some old friends from Grand Prairie, Al and Bunny, who were also down for a week of riding in wild horse country. They told of a foal that had just been born on Friday, October 14, to a mare in a herd we know quite well. They had watched it the first day as the mare tried to move it along. The little thing tripped going over some deadfall and became entrapped in the branches and twigs. It could not get up and the mare and the herd started to move off. Al and Bunny intervened, walked up to it and untangled it. Once on it’s feet it tried to attach itself to Bunny, but being wise in the way of horses, they both backed off slowly. The herd came back and the young thing joined back up with them. 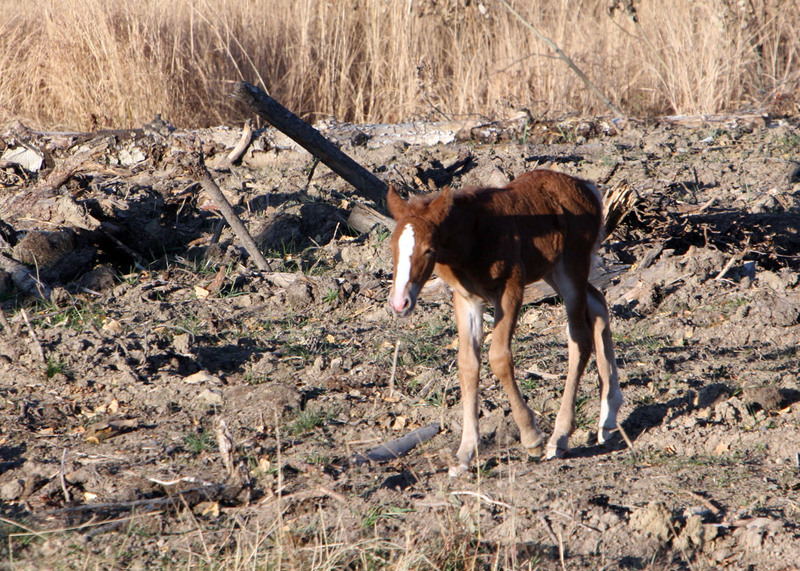 This Sunday after a glorious ride exploring some new trails I found the foal close to the area they had found it in. There it was, still a little wobbly on it’s legs at three days but being able to keep up to the herd. I managed to see that it was able to suckle on the mare for a short time, which is good because we had been worried it may not be getting enough milk. Mom, however, is in excellent shape and the other mares are very watchfull of it. I am going to travel out west Tuesday to make sure it is still okay. It is in an area that will easily allow me to keep a check on it’s growth.